A Help Guide to Relating Better with others. We all can have our own slightly different definition of what a good relationship looks like. But in general, a healthy relationship, whether it is with a friend, family member, partner, or colleague, is one that supports and appreciates you in being fully yourself. 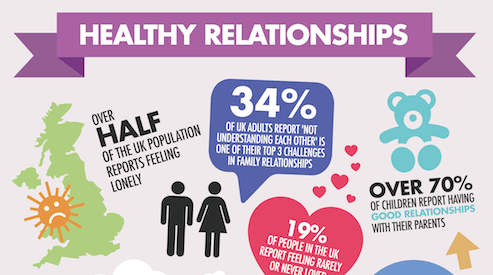 Why are Healthy Relationships so important? Relationships help us know who we are and give us a sense of purpose. They make us feel connected, loved, and loving. And when they are healthy, they are good for us. Studies have found that good relationships help us manage stress better, mean we are more likely to feel good about ourselves, and might even live longer. Supportive relationsihps raise our levels of the feel-good hormone oxytocin, and lower our levels of the stress-inducing chemical cortisol. Good vs Bad Conflict In Relationships - What Is the Difference? We are all unique, so it's unrealistic to agree on everything within a relationship. In fact, if you have a relationship where you both seem to have the exact same opinion on everything all the time, it usually means one person is not being honest with how they really think and feel. Or, maybe he or she has lost their sense of self so much to the relationship they don't even know what they really feel (codependency). So while we all want to feel loved, appreciated, listened to, and heard, a good relationship, from personal to professional, involves the time and commitment of working through the occassional clash. Healthy conflict is not about whether you yell or not. Some passionate sorts have healthy conflict that involves a screaming match, whereas for other people a calm, seemingly reasonable talk is actually very unhealthy conflict in disguise. This is because healthy or unhealthy conflict is not necessarily about your communicating style under stress, but about the results that come from your conflict. Healthy, good conflict results in moving forward to a place of deeper understanding, whereas negative conflict involves repetitive and often stagnant arguments that keep you in the same place. Or, worse, it is conflict that is damaging to the trust you did have. Of course, if your style of conflict is at all agressive, or disrespects a boundary the other person has clearly set (they have asked you not to yell around the children, for example) then your style of conflict can be very unhealthy. Good conflict must always respect the other person and not leave them feeling unsafe. What is the real cost of difficult Relationships? 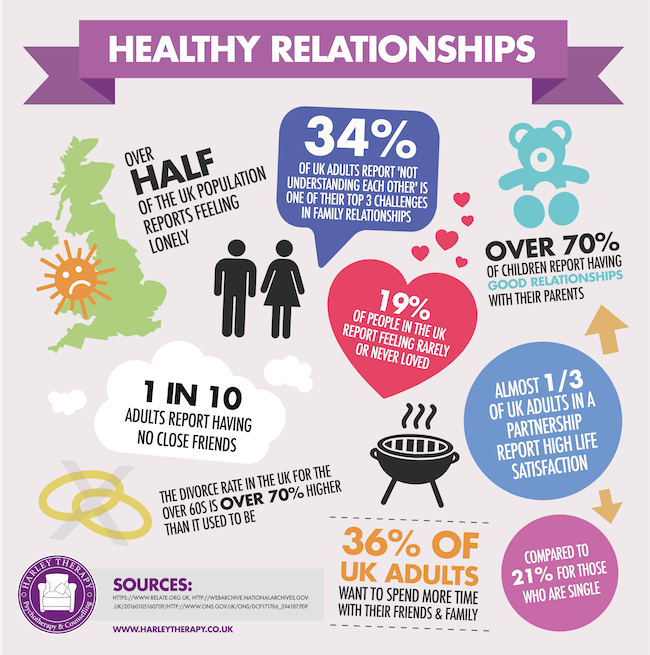 Just as good relationships can improve our wellbeing, difficulties in relating can leave you feeling overwhelmed, exhausted, and even constantly fighting off colds and flu. Constant conflict. While healthy conflict is a part of any working relationship, it should not dominate your time together. Do you fight more than you get along? Is it the same conflict on repeat that you don't seem able to move past? Walking on eggshells. Do you feel nervous all that the time that you have said or done the wrong thing? Feel on edge that your partner might snap at you or change his or her mood? That whatever you do will be criticised? Or, have you been told that you give others a feeling of 'never being good enough'? Constant anxiety. Do you always feel anxious around the other person? Or have a sick feeling in your stomach and muscle tension? Do you walk away from the person feeling exhausted? Or, have you been told you make the other person feel tense? Feeling misunderstood and unheard. Does the other person make an effort to understand you? Do you feel listened to? Or are you always cut off or ignored? Likewise, do you find it easy to listen to the other person? Or do you tune them out? Unequal give and take. Are you always the giver? Do you have a sense of being drained? Or is the other person always having to take care of you? Sacrifice and martyrdom. Do you prioritise the other person's needs before your own? Does your self-care drop when you are involved with the other person, do you stop doing the things that are important to you? Or do you expect them to make you their entire world? Control issues. Do you do whatever the other person says? Or is it important to you that they do what you say and are always available to you? Not knowing who you are anymore. Have you lost sight of yourself because of a relationship? Do you not really know if your likes and dislikes are yours, or theirs? Do you know who you are without them, or have you stopped having a separate life? Emotional, verbal, or physical abuse. Are you constantly being put down and criticised? Is affection and support being witheld? Have you been physically hurt? Or, are you unable to stop yourself from manipulating or hurting the other person? Is a psychological issue the reason relating to others is hard for you? If you are really struggling with a particular relationship, find you constantly repeat a pattern in all your relating that leaves you feeling exhausted, feel unable to maintain a relationship long-term, or are in any kind of abusive relationship, it is highly recommended you seek therapy. All forms of talk therapy actully improve your relationships, because they all help you recognise and break unhelpful behavioural patterns, plus build your sense of self and your esteem. The more you know and accept yourself, the easier it is to understand and be around others. But some forms of therapy are particularly angled just to help you with your relationships. Learn the art of communication. It's not just about 'saying how you feel'. It's about learning to say how you feel and what you think in ways that others understand, and also in ways that do not leave others feeling defensive and judged. Listen properly. It isn't listening if you are just nodding your head but your mind is far away. Put your full focus on the other and aim to see their viewpoint. Learn to navigate conflict. Clarify what you want, recognise what they want, and negotiate a middle ground without blame, bringing up the past, or pulling others into the argument. Become self-aware. It's hard to give and receive in a relationship if you are not doing so from a place of inner stability. Learn who you are, what your values are, and what you really want from life and relationships. This also means recognising and taking responsibility for your own thoughts and feelings, making you less likely to blame and project, both of which damage relationships. Constantly work on your esteem and self-compassion. The better you treat yourself, the better you can treat others, and also allow others to treat you well. If you find having confidence hard, try compassion – treat yourself as nicely as you do your friends. Set boundaries. Learning to say no when you mean it actually improves relationships. It allows others to respect you, and gives them markers for how you'd like to be treated. Recognise your needs and get them met. It's not always easy to know what your needs are, especially if you grew up in a home where you were expected to fit in over speak up. But recognising your needs and ensuring your relationship meets them can end many a conflict before it begins. It also means you can trust yourself to take care of yourself. And the more you trust yourself, the more you can naturally trust instead of doubt others. Deal with your childhood trauma. If a childhood trauma has left you feeling unable to trust or suffering anger, guilt, or confusion around others, the help of a professional to recognise and process your experience can leave you free to have better relationships in the present. Journalling might also be helpful if you'd like a self-directed method to start with, as can bibliotherapy, reading about others experiences that might be like your own and finding out how they managed. Practise good self-care. The better health you are in, the better you feel, the less unecessary stress you will bring to your relationships and the more you can give of yourself to others. Take as much as you give. Of course giving only works if you receive in equal amounts. Expect challenges and lows to match the highs. Relationships, like all things, are a full picture with both ups and downs. Expecting a full experience means you can be calmer when the challenges do come. Interdependency: Can It Save Your Relationship? Doubt in Relationships: Useful or Toxic? Authentic Relationships - Is Your Connection Genuine? *Note: This Guide has been produced by Harley Therapy. It is subject to the usual disclaimers, and is copyright. You can reproduce it if you attribute it to us via a link to this page. Otherwise, feel free to share this on social media using the available 'share' buttons.